There's a new book by Ransom Riggs, Chris Higgins (me), and dozens of other terrific writers. 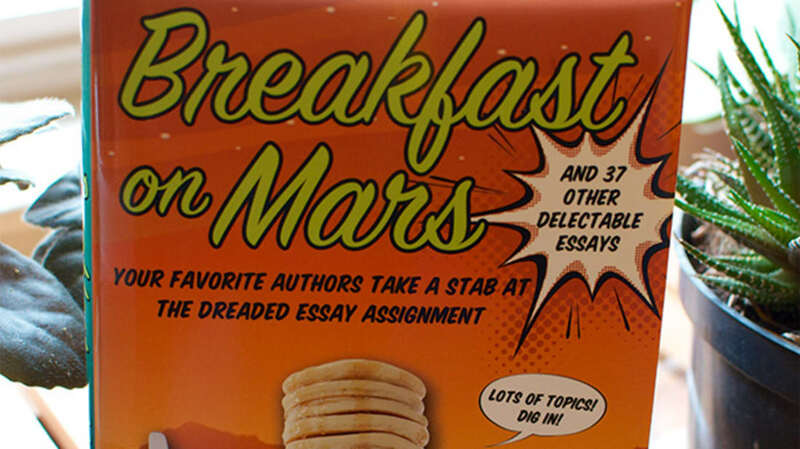 It's called Breakfast on Mars, and it features essays written for students by writers who can actually make "the dreaded essay assignment" interesting. If you know a middle schooler slogging through boring essays and looking for inspiration, you need this book. You'll note Ransom Riggs up there at the top. Since wrapping up his daily blogging gig here at mental_floss, he's been doing pretty well for himself. His first novel Miss Peregrine's Home for Peculiar Children has sold over a million copies, and the movie adaptation is slated for release in July, 2015 -- directed by Tim Burton. (!) The sequel (Hollow City) arrives in early 2014. I should note that Breakfast on Mars received starred reviews from both Kirkus and Publishers Weekly. I am told that this is a big deal. It also seems important to tell you that this is a charity project for the authors -- we don't get a cut of sales and received only a one-time token payment for the essays themselves. Instead of paying 37 authors piddly royalty checks, the proceeds go to Free the Children. What's not to like? I'm so glad you asked. You can find it at your local book store via IndieBound. If you're more of an Amazon buyer, grab it for Kindle (under $9) or in hardcover (under $13). Dig in, everybody!